Last March 23, 2010 I spoke at the Manila Bulletin Job Fair at the Glorieta Activity Center in Makati and in that talk I mentioned how job seekers can stretch their cash while searching for a job. I had a great time that day and I hope that my simple advice will go a long way for those still searching for that career. In this article, I want to expound on this topic to include not just job seekers but literally everyone who is having a hard time in managing their money. I call this article Money Management Simplified because there are really just a few things you need to know if you really want to manage your money well. Like my experience in the job fair, it is my hope that this article will finally help you in getting to where you want to go faster with just a few key action points to do right now. Scenario 1: if my “take home per month” is smaller than my “expenses per month” then my money right now will eventually become zero or in other words, you become “bankrupt”. Yikes!, we don’t want that right. To show you what I mean, let’s go back now to what I asked you to write on that piece of paper. Take home/month + Money right now – Expenses / month = a Negative number; or a Positive Number over time. Scenario 2: But what if my “take home per month” is equal to my expenses per month then my money right now will remain at the same level. That’s good, but if you want to have more money, that’s not good enough. 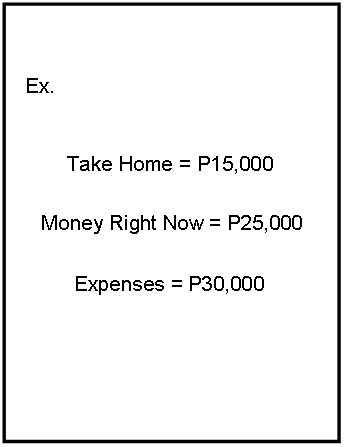 Scenario 3: So what if my “take home per month is more than my expenses per month? Then my money right now will start to increase. This scenario is where you want to be. This is where you start to become financially smarter. 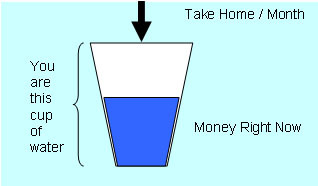 In Money Management Simplified Part 2, I will explain how to get from scenario 1 to scenario 3. By the way, this method of money management is what me and my wife practice day in day out. This is called the “Simple Cashflow Method” which I have simplified even more to get as many of you started in managing your money properly. 1.) Scroll down to the bottom and leave a comment to participate. People should be forced to perform this exercise before they start their own business. Many failures would be avoided! Thanks David, thats my goal, so please do refer as many people to my blog so they can benefit too. thanks for another exercise on money management, Mark! Thank you for this article I hope to learn more from part 2. Thanks a lot for sharing, It broadens my knowledge on how to manage my money. I can’t wait to see scenario 1 to scenario 3. Thank you for the money management information, I am new to the home business field and I have a hard enough time trying to balance my own check book never mind a business account. I do plan on putting this practice to daily use. I’m glad to hear that Jason, more to come! I will wait for the next post. Come back often, it will be posted very soon, meanwhile forward this to your friends. All the best. My pleasure Novie, more to come very soon. Thanks for the information about money mgt… it gives me ideas on how i will manage my money properly. pls always update us more of your advices. I’m learning a lot and definitely wont miss the succeeding articles. God bless you always! Hey Lem! Nice to hear from you. Always glad to hear that you are learning, keep it up. Talk soon! Hi Anthony, thanks for writing in. Thats a very common and great question I get from my students who attend my proactive sales and marketing course at Businessmaker. There are several ways to do it. 1) what you are doing is what i call competition based pricing, while that is ok, i suggest that you also look at a simple cost calculation to know if what you are charging is enough. Do the exercise on this article (money management simplified part 1) add up all your expenses for your practice. 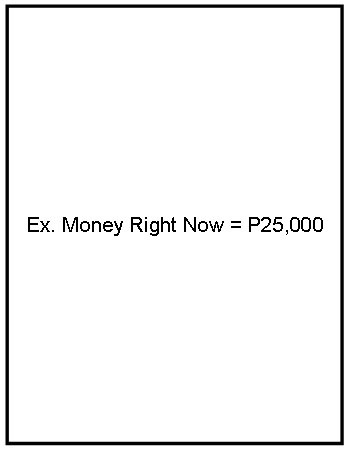 Lets say your total expenses per month is P50,000, next i want you to breakdown your Take home per month, so lets say your take home per month is P50,000 this figure = ave sales price x volume if your price is P500 /patient and your volume is 100 patients per month that = p50,000. So if you cannot add more volume, then increase your price to maybe P700 per patient. If the number of patients remain at 100 per month then your new take home will now be p70000 and your new balance will now have an additional P20,000 profit. If thats a better figure then you’ve got your proper pricing. Hope this helps. Of course you are always welcome to attend my sales and marketing seminar this Sat where i expound on this but also teach you how to increase your total sales with Zero costs. for quite sometime, i just kept your blog recorded in my cellphone hoping to visit it one day until i finally opened it now. the initial presentation was indeed simple but it was very practical and truly enlightening. I am a retired military serviceman hoping to receive my pension arrears in substantial amount soon and I wish to invest part of it in a business or maybe in stocks. problem is i don’t have much knowledge about how this stocks operate aside from what i hear from people, also i haven’t thought much of having a business as again, i don’t know where to start except an invitation from a networking company selling variety of products? maybe i should or must learn more from your articles. many thanks sir. you help a lot of people particularly those who want to be succesful financially. God bless you. I am a retired seaman and my wife has stopped working since we got married 23 years ago.. I am now thinking of how I can manage my hard earned money before it gets depleted before I reach the age of 60. It’s nice to know that there are blogs like these to help people be financially independent. I think my wife & I have to really sit down, talk & apply these methods in our daily lives. Thanks & Have a good day!! More power !!! Nice of you to write in Noriel, I hope that you indeed have a sit down with your wife to discuss this. It is never too late to start and may my blog and articles continue to help you in your life. True. Our Expenses should be lesser than our income. It is always good to live below our means. To become wealthy, we must maintain our lifestyle even if we get an increase in income. Raising our lifestyle with the increase in income would only cause us to break even. Great Article Mark! More Power! 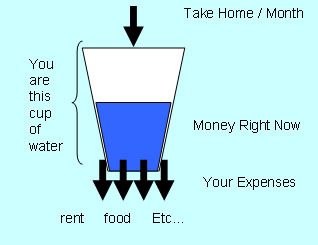 I have seen many different versions of the income/savings/expenses equation, but this version is the easiest to understand and has visual recall thanks to the cup of water illustration. Thanks HP. Hope you get to read parts 2 and 3 as well. This is applicable to those having a fixed income. But how about when one wants to start a business? How can he calaulate his income when sales is still unknow or variable? A business starts out with erratic sales, but a mature business has very predictable streams of income. If your business has been around and still has unpredictable sales after 3 to 4 years, then there is something wrong with how you are doing it. There are ways to beat “seasonality” you just have to learn them. Fortunately, I will be discussing this in the near future. Keep reading and learning Josephine. Very simple and yet effective and easy to apply. I love it. Please do apply it and let us know what obstacles you encountered (are encountering) in applying it into your life. That is how you learn. Hope you finish all the assignments in the wealth plan. It will help you guaranteed. Hi ! Mark and Jhoanna , reading again ( the last time is August 10, 2011) your articles really encourages us to start NOW …. thanks ! Very welcome Patty! No other time is better than NOW. Especially if it involves giving yoirself a better life. Slowly but surely. Your articles are really worth reading for. Thanks again. Thank you Sir Mark for sharing this simple yet very useful framework. I wish I have more “water” pouring in to me or maybe fewer and smaller holes in my bottom 🙂 I’m excited to learn your techniques on how to shift from scenario 1 into scenario 3. More power to you sir! I will try my best to practice this scheme. Once I was able to practice when I was pregnant. I really disciplined myself to save for my delivery. But after birth, that’s when our debts piled up due to misuse of credit cards. For three years, we remained very frugal just to pay off 5 of the credit cards we had. Now we only have one card to be used only in case of emergency. I just hope we will be able to really keep our hands off from using our card. One thing I want to learn is what business to delve into. Is it good to have both jobs and business on the side. Or if I want to have business, then quit my 9-5 job and focus on the business? nice insight. will be applying it to my personal finances. Excellent, don’t forget to emsil us your feedback once you finish wealthplan week 1. All the best Geraldine! This looks pretty simple and common sense, but as with most things, it is easier said than done.I have learned to save from a young age, but my problem right now is how to keep the expenses the same every month too. That’s great again Mark teaching us about Cashflow management. I know how to spend but I don’t know how to save. I should have been opening my emails daily …. should have seen this wealth flow project of yours sooner. Moving onto the next article ……. I did this. It is very helpful. i’m so happy to have you as our financial mentor,i’ve been looking forward for someone who will give us a time to reply to our queries and comments.sir mark, you’ve made us feel existed as a person looking for a leader to guide us well,even stubborn as we are, we will keep following your advice.thannks for making as rich in every step of the way.God will bless you and your family. These are my simple money management. Hope it helps. We have been taught those things in school and at home but somehow they got lost along the way through all those years that we have been struggling to make ends meet. It’s great to have somebody remind us. Thanks a lot Mark! Hi Mr. Mark, this is a very good review on how we can detect the discrepancies in our general income and expenses. Thanks! Mark, though this method is really simple most people don’t know it or some doesn’t to face it, that’s why they get so deep in debt, but putting it in writing seems to have it’s own power and i appreciate it that you try to make it simple so that everybody can learn it. thanks again for doing what you do, good luck and more power!!! I heard once that one of the marks of wisdom is the capacity to simplify things without losing their essence. The analogy you made above is truly neat! Very simple but intellectually elegant. Thank you for showing me a simplified way of understanding money management. God bless you, Mark and Jhoanna! Simple, practical and useful, thanks Mark. It’s a good thing that I’ve learned about this now that I’m still a student (not yet supporting myself independently)! Thank you for simplifying money management! Just keep reading and commenting Alvin. In the school that I work now, many of my colleagues had bad debt. So I will share your idea about money management to them so that they can get out of that bad debt. I will also apply your idea in building my wealth. Since retiring as a Director from a government agency, our family income comes from consultancy services and small business ventures without a definite monthly amount – sometimes, the reward is big; at times, like the recent agri engagement, even our capital got badly hit. Thank you Mark for being generous with your wisdom. I am eager to learn more. Your comment on increasing professional fees re: the dentist above . can not apply to physicians like me. I do charge according to the standard fees for drs in my specialty but many times also charge less and even not at all for indigent patients who can not afford my fees. It does not really bother me as somehow the Lord rewards me financially in other ways. Generosity is a blessing as well my friend so keep it up. Please be sure to read “How to Make Money Run After You Part 2” where I start talking about Money Leeches. If you haven’t done so as well, please do sign up for the “Wealth Plan” to get the articles in the right sequence. sir mark, your article is so helpful.. makes me realize that i really needed an extra income, aside from my fixed monthly salary..
Glad you read this article. May it continue to help you in your quest to be better at money management. what to do if my monthly income is fix only? iam working from 8-6 pm mon-sat? how can i increase my income? helppp! wow! simplified accounting. with this system, i can see where my money goes. thanks sir mark. This enlighten me more. i want to apply this to me and my husbands income.. hope he can read this blog too..
thanks Sir Mark and God bless! The cup framework is indeed simplified. I know my case is scenario 1. Can’t help it (as of now, but hope you can help me go to scenario 3). Because the way I see it, minimum wage is just too low. And setting up business eats up all savings even before starting operations. I expect to learn more from you. Will continue to read on… Thanks for the lessons, by the way. At first it’s really hard to save partially especially if there are lots of expenses. But if you really think of proper spending, then you will realize that saving is a priority. Thank you. I REALLY LEARNED A LOT SIR!!! I REALLY ENJOYED EVERY SINGLE PAGE OF YOU ARTICLE SIR!!! Hi Mark! Can’t believe I am actually doing the steps..this is fun. I like that you are making me realize about something so serious – money thing – in a ligt and fun way. I like the glass illustration a lot.. it ‘s mind opening really. I am really starting to reflect now…seriously. Super thanks for all these. This is just great!!! God bless you. If it is, I hope those who teach it really practice it and not just give lip service to it. Simply desire to say your article is as astounding. The clarity for your submit is just excellent and i could assume you are knowledgeable in this subject. Well together with your permission let me to seize your RSS feed to keep up to date with forthcoming post. Thanks 1,000,000 and please keep up the gratifying work. I really have to watch what I’m spending. I need to save for my retirement! Your articles are really worth reading. I am learning… Thank you! We are glad to hear that Marlene. I have to try this simple cashflow method. This requires a lot of discipline! Basically this is what I used to check if I am making money or not for a particular period. This is so true. Some people will definitely exclaim “oo nga no? !” when they see this. Most of people who have or earn big salaries sometimes forget to just sit down and do the math. In most cases, they do but mostly when their struggling in debt (like what I’ve experienced). So, either you find a way to lower your expenses or you increase your take home money. But when that “light bulb” clicks on, everything will fall into place and will be easier (if not, at least manageable or attainable). Thanks James. Glad you experienced it too and can relate. yeah, it’s look like the leaky bucket of community development. if a community income is leaking outside, they will not progress because their gain is flowing out to other community/ies. but if the gain is revolving within the community, it will stop the leakage going out and income is going in within the community. we are doing community development, but we forget to apply it in ourselves. so, your article is a reminder to me to face the reality, to start within myself, to my family, and having to impart also to those communities that we work on. Yes, very true. Apply first to yourself what you do for your communities. In an Airplane, before take off, the flight attendants will instruct you, if you have a child, put on your mask first, and then the child. Same thing applies with wealth building. Good insights, keep it up. After going thru your simple cash flow formula with my own figures. Am glad to note that at least I’m gaining so far per month. Though I wish it was more on a consistent basis since I’m in the sales field. Thanks for sharing. A very simple and practical way of managing cash! Thank you for sharing. I can’t wait for more. Next page please. Very very applicable to me. Glad to hear that Corinne! it looks like minding our simple arithmetic is the trick. thank you. Thank you Si Mark for giving thsi formula. If I presentr this to my husband , maybe he’ll be thinking a lot of savings for us starting from now . Hope so too Wendy. Welcome to the project. wow, great explanation so simple but very understandable. wow! a simple detailed formula on money matters on a monthly basis but hard do to literally….a good exercise especially for working proffessionals who cannot handle their money so well. thanks for sharing this as an eye opener too for financial wellness. Very informative and detailed. Proceeding now to the next article. Simple matter, but oftentimes overlooked. A lot of people will be inspire to do the same thing in this money management . I wanted to learn and read more from your articles. Im very thankfull and inspired by you sir more power to you . Makes a lot of sense. Simple. Doable. im so excited it feels like im in a treasure hunt that slowly revealing secrets to unlock the treasure chest.thanks a lot i’ll be applying immediately these methods to begin my life changing experience with your articles. Will apply these formula and will share with my daughters too! Great. it’s quite interesting. Thank you for sharing your knowledge. Hi Mark! I’ll apply this method from now on..Can’t wait to read the next part. hi mark – i agree on the wealth flow project … we’ve been doing the + and – thing but one thing which opened my mind today is for us to start consisently tracking our money flow…probably we can make a detailed daily expenses so at the end of the month we can know whether what we spend is a need or a want. if it’s a want probably we will cut this expense then check/analyze the need expenses whether if we can still cut or lessen this. thanks! Brilliant illustration! You showed a very simple and easy to understand illustration of how one can look at money coming in and out of his pocket. Hi, the simple cashflow method yielding a positive number is a good reminder. Thanks. The scheme that you present is very clear. I may also used this formula when I started my own company in near future. Thank you sir for sharing your knowledge. I am that much aware of my expenses every month. Thanks for the information. I’ll monitor it starting tomorrow. Thanks Mr. Mark So. I am not aware of my expenses every month. Thanks for the information. I’ll monitor it starting tomorrow. Thanks Mr. Mark So. Nice formula. Very simple. But the hard part is how to earn more. I going to the next article now. Thanks. Again, you’ve provided us with a very simple and practical way to understand the relationship between income, current cash on hand and expenses. The examples you gave are very easy to understand and it readily shows us to which direction we must to go to start building our wealth. Being in the staus of “below middle class ” at the early stage of my life, I knew the importance of the value of money. During the early part of my marraige, I tried my best to make do of what we earned because I hated the effects of having loans plus its interests. We were able to survive by simple means sans the anxieties of having debts. I simply save our bonuses to pay off our children’s educational expenses. There were months with savings to fund the other months’ deficits – all done via monthly projections throughout the year. Very good illustration Sir Mark. I’m very eager to move to the next article to find out how to get more income pouring into the glass and lesson the.holes. Thank you for the simple and very clear explanation. Things are getting pretty interesting, can i just ask if i can expound more on expenses, meaning detail it would it help me more? Glad to hear that Fronie. Welcome to the project. Simple and effective way of communicating money management. I have a lot of expenses and they are just unpredictable . Sometimes I need to get an installation to buy my kids’ needs like school supplies, books, eyeglasses, medicine. And sometimes my electric bill is low and then higher until I cannot pay it anymore. My income is fluctuating so are my expenses. How can you help me with that? Seems to me that you first have to take control of your fluctuating expenses. Have you started recording them yet? If not, that is where you start. If you have already recorded them the next thing to do is to analyze why they fluctuate. For example, your electricity fluctuates because there might be days when certain appliances are left open, etc. Once you know the cause of the fluctuation, then comes the hard part, be disciplined enough to stop the fluctuation. Afterwards, please read the next articles in the series for help with increasing steady income. I tried recording our expenses in the past but I guess I was just too lazy to keep at it. I can see now from your article that keeping track of expenses is very important. I am slowly getting to my solution, thank you for this simple step to know where we are in our financial life. I actually did it with my wife and no surprise IT’S NEGATIVE. But we are both happy to know that we are getting into a sound solution and smart steps to resolve this. I started doing it this way since a few years back. I learned it the hard way. Very practical and simplified guide for all of us. Thank you very much. Can’t wait to read the next articles. God bless. I am a 24 year old supporting both my senior citizen parents. I work in a government hospital in a probationary position with no benefits. I am aware that my expenses is larger than my income and the only way I know to change it is if I’ll work abroad. This will be harder for me than I thought, but I am still hoping something good will come to me. Simpler illustration than what I’m currently using. Definitely I will adopt this, thanks. This is very true! 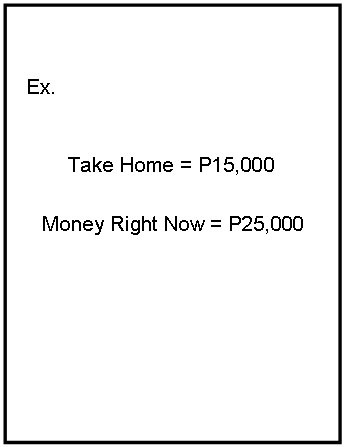 The formula is really simple and easy to understand yet it captures the essence of increasing one’s cash flow. This is really a very simple way to understand things and I like it. Thanks, Mark! Money management simplified indeed! Thanks, Mark! Thank you for this article, the scenarios you’ve written can help me manage my finances. Thank you for this article sir . Glad to know I’m on the right track. I wonder how I can help my boyfriend and sister be on scenario number 3 without appearing as though I’m meddling with their business. But what if your money take home is fixed as well as your expenses.. It’s kinda hard. Thank you for this money management scheme, it is a big help. I do realized a lot of things especially my expenses. I have a lot of expenses.. Thank you sir and looking forward to hear from you. I know that this will help me a lot. Thankyou po sir sa inyong payo makakatulong po ito sa aming pamilya. A simple analysis of our personal finance yet very inspiring and very useful! Very well-explained Sir Mark! Thanks! Happy New Year! It is now 2010 and I hope you are looking forward to a great and wonderful year ahead. This is the time of the year when I am often asked, what’s a good business or investment to get into? So for my very first column of the year,Start of the Year Advice: Invest In Your Self First! So today, I wanted to share another important lesson in entrepreneurship. It is a lesson rooted deeply in our Filipino culture valuing hard work above everything else, which I believe is correct, but incomplete. I say this because I once thought that working hard, sacrificing and putting in the effort wasIn Business, is it better to be Juan Masipag or Juan Tamad? 90% of the Time… …When someone tries to sell you something, you feel that they are there to try to “take” your money away from you. May it be the mall and someone runs after you giving you a flyer for a P2M condominium investment or a text message offering youSelling Is About Giving, NOT Taking. "That was awesome Mark. it is truly inspires me while reading your articles. More power to you. Hope I could pass by to attend in one of your Seminars." "...earning is one thing, but getting my house in order is another. i honestly don't know much about money management, and i've already learned a lot from your articles. thank you very much! i like that what you write is very simple, practical, and easily applicable. God bless!" for quite sometime, i just kept your blog recorded in my cellphone hoping to visit it one day until i finally opened it now. the initial presentation was indeed simple but it was very practical and truly enlightening. I am a retired military serviceman hoping to receive my pension arrears in substantial amount soon and I wish to invest part of it in a business or maybe in stocks. problem is i don't have much knowledge about how this stocks operate aside from what i hear from people, also i haven't thought much of having a business as again, i don't know where to start except an invitation from a networking company selling variety of products? maybe i should or must learn more from your articles. many thanks sir. you help a lot of people particularly those who want to be successful financially. God bless you." i've been getting updates from businessmaker academy in my email and honestly, i can't remember when i signed up or got the updates. since i was into putting up a business, i stuck to getting updates. i read this article now and it really makes sense i would want to know more of your seminars but i am here in mindanao. hopefully, i can get to read parts of your seminars soon here in your blog. and i am hoping that soon, i can get to attend one of your seminars. Keep these helpful posts coming! Thanks for the insight you are sharing with us. I would like to share this story to my husband whose working so hard. He might slow down towards his work habit when he read this story. Belated happy b-day to your wife!" "Hi sir Mark, What a powerful mind blowing technique in eradicating "Money Leeches" even if it seems heartless, the truth of the matter is you have to do it or either you will remain in the same financial state...More power...from Cartagena,Colombia."